Because for the rest of the times the Himalayas are covered in snow. One story goes that the holy river Ganga was flowing down the Himalayas in immense fury and power, causing great devastation every where she went. The people prayed to Lord Shiva to save them from Ganga - and Lord Shiva sitting in Mt. Kailash [Himalayas] makes Ganga flow through his matted hair, thus calming her down! Every statue of Lord Shiva or pictures of Lord Shiva will depict The Ganga flowing from his hair.
. WKD : Gangotri . Jagannatha's collection of poems is entitled 'Ganga-Lahiri', or The Waves of Ganga. I come to you as a child to his mother. A river that inspires such outstanding and pious creative devotion must be some river indeed. 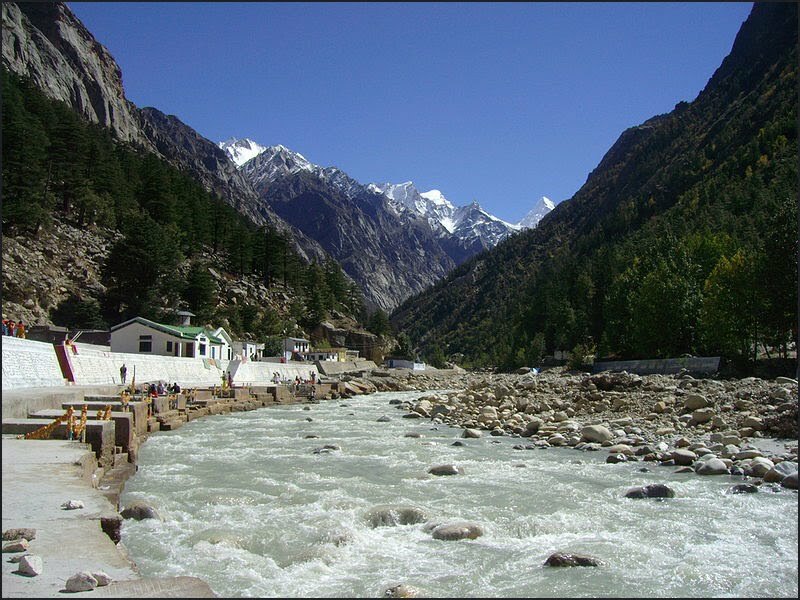 Truly Ganga is a river that has been at the core of sacred Hindu lore and tradition since time immemorial. The esteem in which she is held and her consequent deification as a full-blown woman echoes the timeless ethos of Hindu wisdom. a trans-boundary river of India and Bangladesh. The 2,525 km (1,569 mi) river rises in the western Himalayas in the Indian state of Uttarakhand, and flows south and east through the Gangetic Plain of North India into Bangladesh, where it empties into the Bay of Bengal. It is the longest river of India and ranks among the world's top 20 rivers by amount of water discharge. The Ganges basin thus formed, is the most heavily populated river basin in the world, with over 400 million people and a population density of about 1,000 inhabitants per square mile (390 /km2). The Ganges is the most sacred river to Hindus and is also a lifeline to millions of Indians who live along its course and depend on it for their daily needs. It is worshiped as the goddess Ganga in Hinduism. tidal waves . . .
Ganga is coming down the Himalayas. Fuji river is from Mt. Fuji in Japan. Himalaya is 8000 meters,and Fuji is 3766 meters. Our couples have grown up at the foot of Fuji river. We know the fear of blood and beauty of high. Ganga and Himalayas are much more divine than Fuji ,but we love beautiful Fuji san. Jhaanhavi is a lesser known name of Mother Ganga.
" The ageless mother grace who destroys the sins accrued for ages" for an elucidatory translation. Jhaanhavi is another name of river Ganga. From your banks, O Mother Ganges! Read a wonderful haibun in this link. VARANASI, India -- With her eyes sealed, Ramedi cupped the murky water of the Ganges River in her hands, lifted them toward the sun, and prayed for her husband, her 15 grandchildren and her bad hip. She, like the rest of India's 800 million Hindus, has absolute faith that the river she calls Ganga Ma can heal. Around Ramedi, who like some Indians has only one name, people converged on the riverbank in the early morning, before the day's heat set in. Women floated necklaces of marigolds on a boat of leaves, a dozen skinny boys soaped their hair as they bathed in their underwear, and a somber group of men carried a body to the banks of the river, a common ritual before the dead are cremated on wooden funeral pyres. To be cremated beside the Ganges, most here believe, brings salvation from the cycle of rebirth. "Ganga Ma is everything to Hindus. It's our chance to attain nirvana," Ramedi said, emerging from the river, her peach-colored sari dripping along the shoreline. But the prayer rituals carried out at the water's edge may not last forever -- or even another generation, according to scientists and meteorologists. The Himalayan source of Hinduism's holiest river, they say, is drying up. In this 3,000-year-old city known as the Jerusalem of India for its intense religious devotion, climate change could throw into turmoil something many devout Hindus thought was immutable: their most intimate religious traditions. The Gangotri glacier, which provides up to 70 percent of the water of the Ganges during the dry summer months, is shrinking at a rate of 40 yards a year, nearly twice as fast as two decades ago, scientists say. "This may be the first place on Earth where global warming could hurt our very religion. We are becoming an endangered species of Hindus," said Veer Bhadra Mishra, an engineer and director of the Varanasi-based Sankat Mochan Foundation, an organization that advocates for the preservation of the Ganges. "The melting glaciers are a terrible thing. We have to ask ourselves, who are the custodians of our culture if we can't even help our beloved Ganga?" Environmental groups such as Mishra's have long focused on pollution of the Ganges. More than 100 cities and countless villages are situated along the 1,568-mile river, which stretches from the foothills of the Himalayas to the Bay of Bengal, and few of them have sewage treatment plants. 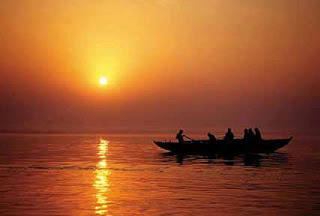 But recent reports by scientists say the Ganges is under even greater threat from global warming. According to a U.N. climate report, the Himalayan glaciers that are the sources of the Ganges could disappear by 2030 as temperatures rise. The shrinking glaciers also threaten Asia's supply of fresh water. The World Wildlife Fund in March listed the Ganges among the world's 10 most endangered rivers. In India, the river provides more than 500 million people with water for drinking and farming. The immediate effect of glacier recession is a short-lived surplus of water. But eventually the supply runs out, and experts predict that the Ganges eventually will become a seasonal river, largely dependent on monsoon rains. "There has never been a greater threat for the Ganges," said Mahesh Mehta, an environmental lawyer who has been filing lawsuits against corporations dumping toxins in the Ganges. He is now redirecting his energies toward the melting glaciers. "If humans don't change their interference, our very religion, our livelihoods are under threat." Mehta and other environmentalists want to see the Indian government here enforce strict reductions of greenhouse gas emissions, the primary cause of climate change. But during this month's Group of Eight conference of the major industrialized nations, both India and China, eager to protect their market growth, joined the United States in refusing to support mandatory limits on greenhouse gas emissions. President Bush has instead pushed a plan for nonbinding goals to reduce emissions. "It is a fact that more and not less development is the best way for developing countries to address themselves to the issues of preserving the environment," Indian Prime Minister Manmohan Singh said in a public statement before leaving for the G-8 summit in Germany. While India is one of the world's top producers of greenhouse gas emissions -- along with the United States, China, Russia and Japan -- it argues that the United States and other developed countries should reduce their own emissions before expecting developing nations to follow suit. Environmentalists call that kind of thinking shortsighted and say India desperately needs strong laws in place at a time when the country is growing so quickly. "Economic growth is important, but can you imagine a billion cars in India?" Mehta asked. "As people become affluent, they want cars and air conditioners and refrigerators. What effect is that going to have on the environment?" About 1 million pilgrims a year visit this ancient, hardscrabble city, many traveling hundreds of miles on foot. Many of them leave with vials of Ganges water to wear around their necks or display in their homes, sometimes sprinkling droplets of water into their town's wells, spiritually purifying their drinking water. On the stone steps leading up to the Ganges' famous temple ghats, graffiti reads: "Happy is the person who lives by Ganga, Ma" and "I love my India." "The government should realize that climate change will hurt not just communities, but also businesses and even the Ganga itself, our most sacred river," said Srinivas Krishnaswamy, a climate and energy expert for Greenpeace in India. "When the Ganga River is threatened, Indians will have to wake up the government to this crisis."